The Atlantic Ocean Hurricane Season runs from June 1 to November 30. In the eastern Pacific Ocean, Hurricane season runs between May 15 and November 30 each year. These dates simply border the times when most tropical cyclone activity happens in this region. The National Oceanic and Atmospheric Administration’s (NOAA) National Hurricane Center forecasts tropical cyclones (the generic name for hurricanes, typhoons, tropical storms, tropical depressions) in the eastern Pacific and Atlantic. NASA provides satellite data and conducts tropical cyclone research. NASA has several satellites in orbit around the Earth that are used to study different aspects of these tropical cyclones, and NASA scientists conduct hurricane research all through the year. Satellites include the Tropical Rainfall Measuring Mission satellite, Aqua, QuikScat, CloudSat, the Geostationary Operational Environmental Satellite (GOES), JASON-1, OSTM/Jason-2, Landsat, and Terra. Except for GOES, which is managed by NOAA, all missions are managed either out of NASA Goddard Space Flight Center, Greenbelt, Md. or NASA’s Jet Propulsion Laboratory, Pasadena, Calif. NASA Goddard’s GOES Project Office generates GOES images and animations. NASA data currently indicate that sea surface temperatures in the tropical Atlantic are below normal. These cooler than normal ocean temperatures could “starve” developing hurricanes of their driving force, which are waters warmer than 80 degrees Fahrenheit, thus suggesting a damping of hurricanes. In the Pacific, the Pacific Decadal Oscillation’s (PDO) characteristic warm “horseshoe” and cool wedge pattern is still strong in the sea surface temperature and sea-level height images. 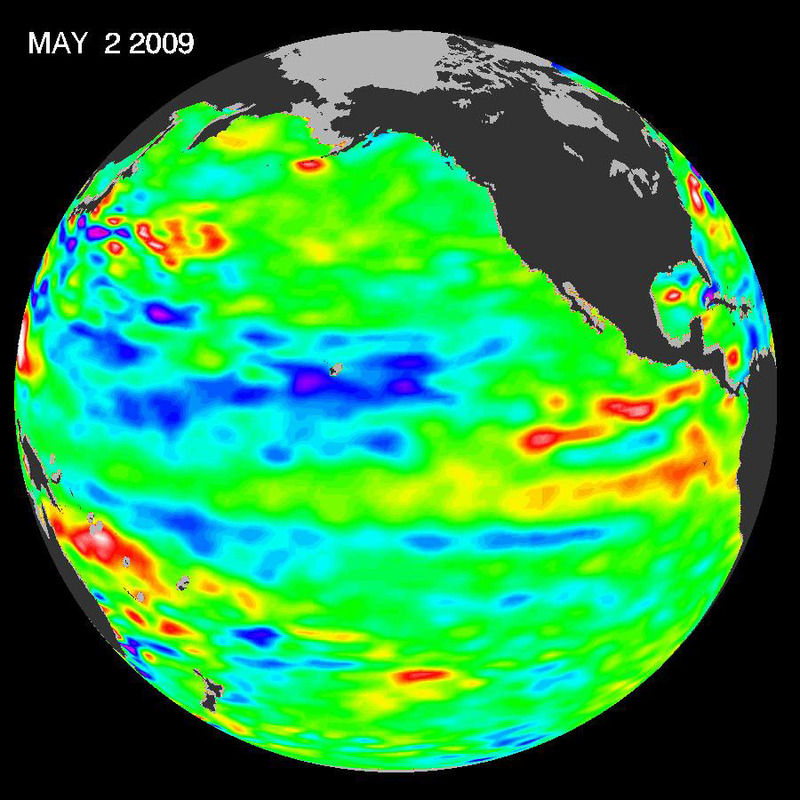 The PDO is a long-term ocean temperature fluctuation of the Pacific Ocean that waxes and wanes approximately every 10 to 20 years. Most recent NASA sea-surface temperature and height data clearly illustrate the persistence of this basin-wide pattern. “While this PDO pattern tends to make the formation of a new El Niño event less likely, the warm waters in the western Pacific favor a very active western Pacific typhoon (“hurricane” in the eastern Pacific and Atlantic) season and inhibit the hurricane damping condition over the Atlantic and Caribbean,” said Dr. William Patzert of NASA’s Jet Propulsion Laboratory in Pasadena, Calif.
Patzert sees merit in the cautionary Atlantic hurricane outlook released by NOAA’s Climate Prediction Center in May. “It is the beginning of a long summer and oceanic and atmospheric conditions can change dramatically,” Patzert said. Statistics and probabilities of today have huge wiggle room. By fall, today’s conditions can change. Being vigilant and preparing for a major hurricane is still the best way to prepare for any hurricane season. “Along hurricane-prone coasts and areas, be ready; you can be clobbered no matter what the expert outlook is today,” said Patzert. Whenever and wherever a tropical cyclone forms, NASA satellite data will provide data that will help forecasters get a better idea of how it’s going to behave.